With an ultra-cool mission of boldly going where no man (-made craft) has gone before to hunt for planets, NASA’s Kepler mission has found the first near-Earth sized planet in the “habital zone” around a star like our sun. 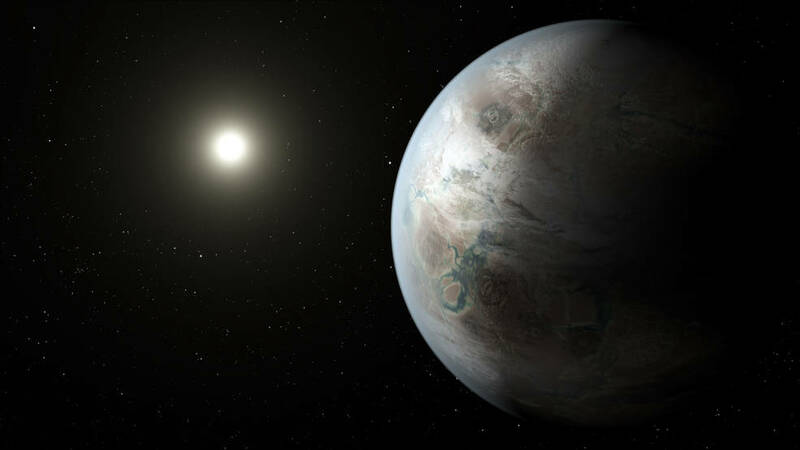 Although I’m not impressed with the name they’ve given it, Kepler-452b (Keplearth would be way better) is the smallest planet to be found orbiting in this type of zone, which is the area around a star where water could pool on the surface of an orbiting planet. Kepler-452b is about 60% larger than Earth. The Sun is a G-type main-sequence star (G2V) based on spectral class and it is informally referred to as a yellow dwarf. The type of star Kepler-452b orbits is called a G2-type star, just like our own Sun (presumably with more standard options than previous G versions). The Sun Kepler-452b orbits is older, bigger and brighter than our own Sun. Lesson from Khan: Keeping track of those you exile makes good sense. Since Kepler launched in 2009, it has found 4,696 planet candidates. The discovery of Kepler-452b brings the total number of confirmed planets to 1,030. 12 of the planets found by Kepler so far are near-Earth size. The obvious question is: are there any signs of life on this new planet? I don’t think it’s too much of a stretch to say that there is no intelligent life on Kepler-452b. So maybe it would be better to save the name Keplearth for a more habitable planet. Cool DIY rocket using a match. This has dude time-waster written all over it. Trippy eye test. Who will you see? Check it out!